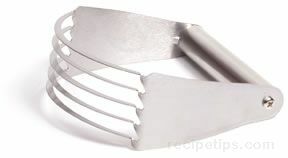 A hand-held kitchen utensil that serves to blend, whip, whisk, chop, or slice small food items. 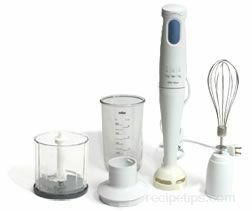 The Immersion Blender, also known as a Hand Blender, is a good option for small tasks that do not require the heavy-duty aspects of a food processor. Built for light to medium duty blending often required during the preparation of foods, an Immersion Blender works well for whipping cream beating egg whites, puréeing small foods or chopping items such as nuts and herbs. Available as either a battery operated or electric utensil, the Immersion Blender can be purchased with additional accessories which may include: whisks or blades that are easily detached; blender canisters to hold ingredients for blending or chopping (nuts and herbs); and strainers to assist with the prepartion tasks. When selecting, consider the performance of the unit, which is not necessarily based on the wattage, since lower watt models often blend as well as units with twice the wattage. 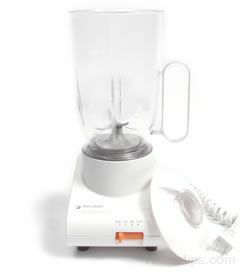 Better performing blenders may be measured on how well they chop or blend larger food items, how easily they can be cleaned, or how well balanced they feel in the hand. Choosing a stainless steel encased blender over a plastic blender is most likely a choice for anyone using the blender in pots or pans close to heat sources where the temperature may soften the plastic. Otherwise, there may be little difference between the two types. For cleanup, detatchable blades are of value to make the job easier.